EU Council Regulation 6/2002 on Community designs (Community registered designs rules). Passing off – if the shape of a product (eg, the Coca-Cola hourglass bottle) is sufficiently distinctive and associated with a particular company, a competitor product with a similar shape may constitute a misrepresentation of a connection between the parties, leading to damage to the reputation of the first product and its producer. This may be actionable in the United Kingdom under the common law of passing off. Perhaps the most famous relevant case is that of Reckitt & Colman Ltd v Borden Inc, known as the ‘JIF lemon’ case, which related to lemon juice sold in yellow plastic containers resembling lemons and which confirmed the test for assessment of passing off. Unregistered design rights are protected against infringement separately under UK and EU law. As unregistered rights, the protection in question is generally limited to protection against copying. In UK legislation, a ‘design right’ is defined as “the shape or configuration (whether internal or external) of the whole or part of an article”. The amount of use is not determinative as to whether there is infringement. The critical issue is the ability of the owner of the unregistered design right to prove that it is the owner and that it created the design in question before use by the alleged infringer. aspects of designs which ‘must fit’ with or ‘must match’ other products (eg, spare parts for motor vehicles). Any individual or legal entity can apply for and own a UK registered design. The essential requirements are that the design must be new and have individual character. If a published design (a design “made available to the public”) exists which is substantially identical to the design which is the subject of an application, the design is not new. As with registered design applications at the EU Intellectual Property Office (EUIPO), the UK Intellectual Property Office (UKIPO) does not conduct substantive examination of registered design applications. It is therefore possible to register a design which is not new and has no individual character. It is necessary to apply for a declaration of invalidity of a design once registered. The UKIPO encourages online filing and has recently made further substantial improvements, as well as providing incentives, to use its online filing process. An online application can include up to 12 representations of the design in the usual electronic formats. The representations can be photographs, line drawings or computer-aided design representations. The UKIPO emphasises that it is critical that the representations clearly represent a single view of the design with no extraneous matter. Further detail regarding the requirements in relation to representations are available (www.gov.uk/guidance/designs-examination-practice/part-c-formalities). a further £20 for each of the next 10 designs, up to a maximum of 50 designs in each multiple application. The timescale from application to registration can be as short as a few days, assuming that there are no official objections. Deferral of publication is possible in a similar manner to that for which the EUIPO provides – up to a maximum of 12 months and subject to payment of additional official fees. As part of the UKIPO’s initiative to make its system more user-friendly and reduce delays, it is no longer necessary to file certified copies of priority documents if, when filing the application, the filer can confirm that the design from which the UK application claims priority and the UK design application are identical in all respects. Alternatively, there is a paper form which the filer can use to confirm that the respective designs are identical. If the filer is unable to confirm this, the UKIPO will set a three-month term to file a certified copy of the priority document. If the priority document is not in English, the UKIPO may also request a certified translation. A UK registered design is registered for an initial five-year period from the date of registration. Renewal is possible for four further five-year periods, subject to the payment of renewal fees which are currently £70, £90, £110 and £140, respectively. In 2018 the United Kingdom ratified the Geneva Act (1999) of the Hague Agreement. As a result, it is now possible to designate the United Kingdom in international design applications filed under the Hague Agreement, and UK individuals, companies and those having “real and effective commercial establishments” in the United Kingdom can now use the Hague Agreement to obtain registered design protection in a total of 69 contracting parties, including the EUIPO. In the widely reported case of PMS International Group Plc v Magmatic Limited, Magmatic – the manufacturer of TRUNKI ride-on suitcases for children – sued PMS for infringement of a Community registered design relating to a suitcase. At first instance, the High Court found in favour of Magmatic. PMS appealed successfully in the Court of Appeal and Magmatic appealed to the Supreme Court. In 2016 the five judges of the Supreme Court unanimously dismissed Magmatic’s appeal. The primary issue was that the representations of the design as registered showed elements in grey and black, which the Supreme Court held to indicate contrasting colours. The Supreme Court therefore concluded that the scope of the registered design was not purely for the shape of the suitcase and that as such, the PMS suitcase did not infringe the registered design. The court acknowledged that the idea of the TRUNKI suitcase was “a clever one” but also stated that “design right is intended to protect designs not ideas”. At the time, several reports of the case concluded that Magmatic should have registered many more designs in relation to the TRUNKI suitcases. However, it is often the case that individuals and companies have insufficient resources to do so in the early stages of their business. In an earlier but equally well-known case, Procter & Gamble Co v Reckitt Benckiser (UK) Ltd, Procter & Gamble issued proceedings against Reckitt Benckiser for infringement of a Community registered design of the shape of its FEBREZE air freshener by Reckitt Benckiser’s AIRWICK air freshener. The more novel the registered design the more significant the overall impression is likely to be and the more room there is for differences which do not create a different overall impression. The court must ‘don the spectacles’ of the informed user. The overall impression of the registered design and the alleged infringement must be identified with care and thought, given the level of generality that would be adopted. In relation to a registered design, the monopoly extends to preventing third-party use of an identical or similar design, subject to tests relating to the overall impression of the designs and the informed user. By contrast, unregistered design rights allow the owner to prevent copying by making identical or substantially similar articles using the design. an injunction against future infringements. It is possible to assign or license registered designs and unregistered design rights. It is also possible to record security interests against registered designs. An assignment or licence of, or a security in relation to, a registered design is ineffective unless it is in writing and signed by or on behalf of the assignor. Recordal requires submission of a form for which there is currently no official fee. There is no time limit for recordal of an assignment, licence or security interest in relation to a registered design. However, failure to record a licence will mean that it is ineffective against a third party acquiring a subsequent interest in the registered design. It is also highly advisable to record an assignment, licence or security interest in order to make it easier for the party acquiring the right in question to enforce its rights. The primary related rights are trademarks (registered and unregistered) and copyright. It is possible to register three-dimensional trademarks in the United Kingdom. However, unless the mark is unusual, it may be necessary to show through evidence that it has acquired distinctiveness through use and is therefore able to function as an indicator of source. There are other bases on which the UKIPO may object to applications to register shapes as trademarks, including whether the shape adds substantial value or is the shape of the product itself. Further detail is available in the UKIPO examination guide (www.gov.uk/guidance/trade-marks-manual/the-examination-guide). Shape marks which are in use may also benefit from protection under the common law of passing off. There is a further overlap with regard to logos, as it is possible to register these as designs or trademarks. It is possible to protect aspects of a design, including surface decoration, under copyright law. As copyright comes into existence automatically, the initial onus is on the owner of the copyright to establish that it is the owner and that the work in which copyright subsists predates the allegedly infringing product. 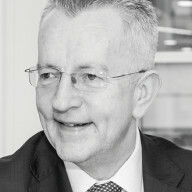 Chris McLeod is a partner in the London office of Elkington and Fife LLP and leads the firm’s trademark practice. Mr McLeod has more than 30 years’ experience in the field of designs, trademarks, copyright and associated aspects of intellectual property. He is a past president of the Chartered Institute of Trademark Attorneys and an active member of the International Trademark Association and the Pharmaceutical Trademarks Group. He is a regular speaker and commentator on IP issues.